This chapter is a culmination of several whitewater river clean up trips done with Steve May and the Lighthouse School in Price, Ut. We worked 84 miles of the Green River through Desolation Canyon, camping for 7 days on each trip to accomplish the goals. Like the name implies it's a very remote location in eastern Utah. Walking out if somebody gets pissed is a sure way to perish. The hospital isn't really an option, unless we could get service with the satelite telephone, then we could call a helicopter, if there was a place to land near by. It's crucial that everybody understand where they are on the face of the earth. The simplest mistake, like stepping off a boat wrong and twisting an ankle, or getting burned by the fire could have devastating results. On one of the trips I had a couple girls that were ordered by the court to be there. I wondered what I was getting myself into, but Steve assured me that everything would be fine. Sometimes the kids would show up in full gangster regalia. The style with baggy pants, and hats on crooked. After a couple days they could see that nobody for miles around cared about any of the impressions they were trying to leave so we could get to work. The objective of the trip was to clean up trash out of the river. Trash pieces including semi truck tires, and pallets, and rusty old 55 gallon drums, to plastic soda bottles, and pieces of styrofoam from a cooler that broke apart 50 years ago. So when you throw away styrofoam think about where it'll end up. The work seems to have intangible benefits at first, but as the trash starts to build on the rafts it becomes apparent, really fast, how much of a difference the kids are making and they get really excited about it. The challenge of the trash lies in every aspect of the trip. When pulling a broken pallet, with rusty nails, from the river not only do they need to be careful not to cut themselves, but they also need to be careful not to puncture the inflatable rafts. Here's Steve and some kids digging an old flight of stairs out of a driftwood pile. ...that we loaded up. It lived the next 4 days on the river with us, always in the way. After a while they started making fun of the patrol boat because it was getting so ugly. The two court ordered girls testing Steves meter-o-fun. The two girls on cook crew the last night on the river. My two personal water sample slaves...oh and pyromaniacs. Check out the t-shirt on the right. Pipe from the oil fields 100 miles up-stream that took four hours to dig out of the mud. This trip we picked up 9 pallets, this is a few of them. ...but we started running out of room on the boat, so every night in camp we would burn the pallets, then carry out the ash and nails in military rocket boxes. The pyros had a good time with the fires even though it was still 90 degrees at 10pm. We use fire blankets and fire pan so as not to leave the charcoal on the ground. As you can see when entering an archeological site the charcoal lasts thousands of years. If we all left a little the beaches would be a mess especially when the river gets really low. If we stay on top of the big trash items the canyon stays surprisingly clean. 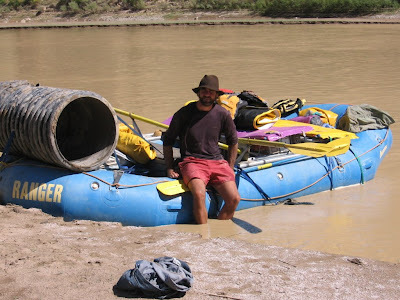 Most of the rafters that go through the canyon take it upon themselves to pick up trash items when they see them, but understandably they don't want to put big nasty, rusty items on their boats.